Businesses face a multitude of challenges in today’s environment. For example, the speed at which businesses make decisions has increased, the number of channels used to communicate has diversified, and consumer expectations have amplified. With these challenges in mind, organizations need to ensure that every client interaction, regardless of channel, is positive. But to truly deliver a positive customer experience, businesses rely on existing customer data. 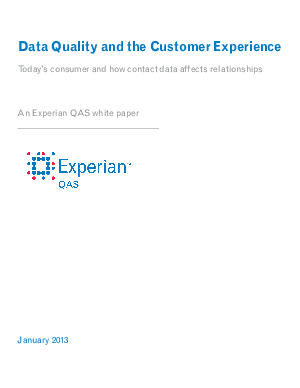 This white paper highlights new research from Experian QAS on existing data quality perceptions and inaccuracies. Find out how existing data errors affect the business and what safeguards organizations may use to protect against the capture and use of inaccurate customer data.